The Center for Medical Progress (whose site is crashed today) has splashed the results of a 30 month long Human Capital Project which documented how Planned Parenthood disperses the body part industry among its affiliates, so they can take the fall when someone blows the lid off of this illegal operation. The journalists painstakingly attended abortion conventions and gathered paperwork and video footage to produce a rare example of actual investigative journalism. Hats off to these intrepid throwbacks to the day of real news gathering and reporting. SEE Planned Unparenthood Director of Medical Services, Dr. Deborah Nucatola chomping her salad while she discusses the manner of selectively crunching babies in utero so as to avoid damaging the parts of interest to customers. SEE CEO, Cecile Richards acknowledging the baby parts industry and say how Amazing Dr. Nucatola is. The Youtube vid is working as of now. Tweet your disgust…… Jill Stanek explains the pro-life twitter mission at the end of her blog article. 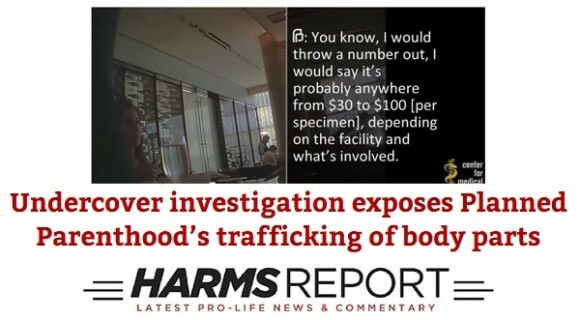 Everyone needs to know just how low Planned Unparenthood can go. Get the word OUT. #PPSellsBabyParts. Next ›The Woes at Stem Express after People Learn Planned Parenthood Sells Baby Parts. Put on your surprise face! Klan Barrenhood sells baby parts after murdering 350,000+ a year by surgery alone!